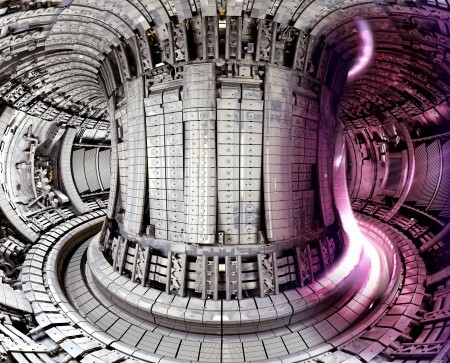 On September 2016, the team from the MIT PSFC used the final run of their Altacator C-Mod tokamak, a magnetic confinement fusion reactor, to test a new additive to fusion fuel. In an attempt to improve heating efficiency, the MIT researchers included trace amounts of helium-3, which is extremely rare on the earth, to the typical combination of deuterium and hydrogen. The scientists then heated the elements with radio-frequency waves to achieve ground breaking levels of megaelectonvolt (MeV) energies. An electronvolt is a common unit of measurement for fusion experiments, which is determined by the amount of energy gained or lost when a single electron jumps from a point of electric potential to a point one volt higher. Both the Alcator C-Mod and JET are experiments that were designed to simulate the conditions that plasma would face in a fusion reactor. However, these designs are smaller and do not produce fusion energy that is converted into power. Plasma is the state of matter in a gaseous substance that becomes electrically conducive. It is only when plasma is confined under intense heat and pressure that atoms can fuse together and release their nuclear energy. Once perfected, nuclear fusion has the potential to revolutionize energy production. By fusing common elements like hydrogen and helium, fusion could produce virtually endless power with no dangerous waste products or toxic emissions. Experiments like the Alcator C-Mod and JET help scientists and engineers move closer to determining the right conditions and design elements to create a functional, energy-positive fusion reaction that can reliably produce more power than it consumes. It is therefore essential to our country’s long-term energy security to provide the necessary funding and assistance that scientists and engineers require to pursue this revolutionary technology. However, nuclear fusion development has struggled due to inconsistent funding and a lack of long-term vision among many policy makers. For example, the Alcator C-Mod tokamak that MIT researchers used to make this major discovery was shut down soon after this experiment due to federal budget cuts. Progress in such an instrumental field simply cannot be achieved under such constraints. The American Security Project has written “[f]usion energy can meet America’s energy needs… [but] given current support for fusion, commercializing this power source remains decades away.” In our 2014 Fusion White Paper we lay out a number of key recommendations to accelerate fusion development without breaking the bank. First, the U.S. should make a national commitment to fusion development. Second, Congress can allocate $30 billion over 10 years. Finally, the U.S. government should encourage U.S. scientists and engineers to build a burning plasma facility within a decade. To achieve these goals, the U.S. government should appoint a fusion power commissioner to oversee U.S. fusion development. If the U.S. is serious about scientific leadership and energy security, fusion research can ensure its long-term energy security and a dominant position in this revolutionary field.